Upstairs Downstairs is a British television program that aired over five series (which Americans refer to as seasons) from 1971 to 1975 on ITV and was brought back by the BBC for an abbreviated sixth series in 2010. It crossed the pond in 1974 where it was shown on PBS' Masterpiece Theatre and earned international accolades, winning BAFTAs and Emmy Awards. Though for some odd reason, the first U.S. series was comprised of three episodes from the first UK series (episode #1 "On Trial", #10 "A Voice from the Past", and #13 "For Love of Love") and 10 episodes from second. The 13 unaired episodes from the two series were eventually shown in America in 1989. The "Upstairs" of the title refers to the Bellamys of 165 Eaton Place, London. They are Richard Bellamy MP (David Langton), Lady Marjorie (Rachel Gurney), and their two children, James (Simon Williams) and Elizabeth (Nicola Pagett). 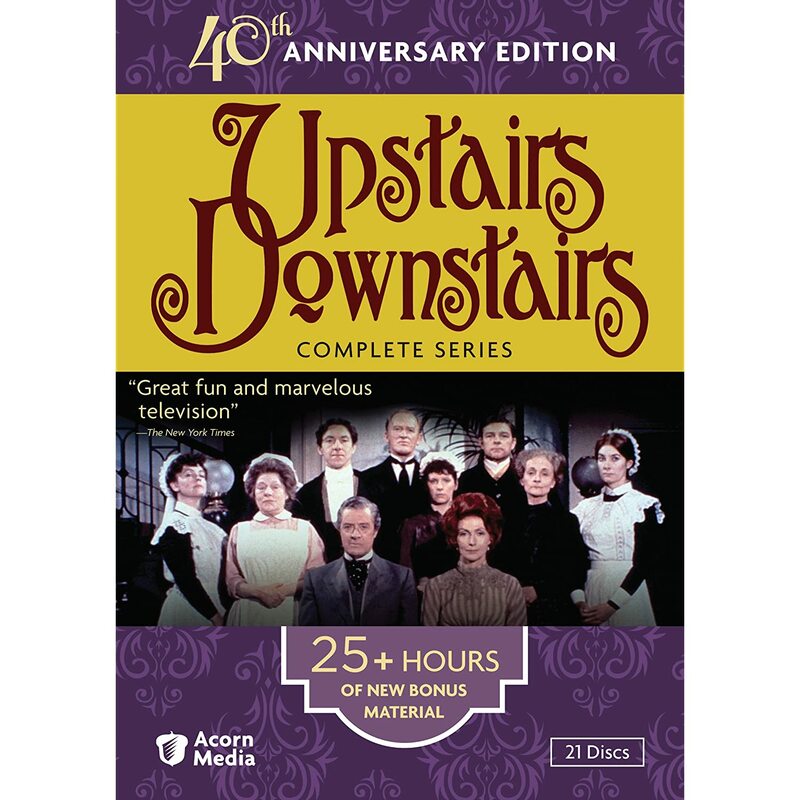 "Downstairs" refers to the servants of the house led by butler Angus Hudson (Gordon Jackson) and includes head house-parlourmaid Rose Buck (show co-creator Jean Marsh), cook Kate Bridges (Angela Baddeley), kitchen maid Emily (Evin Crowley) and footman Alfred Harris (George Innes). Series One tells the stories of these characters and their intertwined lives from November 1903 to June 1909, and begins with "On Trial" as a new maid (Pauline Collins), dubbed Sarah, joins the staff. She's got a headstrong personality and it's no surprise that she doesn’t hold the position long. She unintentionally creates a spectacle when she agrees to pose for a painter who has been commissioned to paint Lady Marjorie's portrait in "The Mistress and the Maids." She resurfaces towards the end of the series. The Upstairs characters are no strangers to scandalous behavior themselves. Elizabeth skips out on her society debut in "The Path of Duty" and fights against society's conventions. In a particularly well-written and well-acted episode, "Magic Casements" finds Lady Marjorie growing apart from husband Richard due to their differences in politics. She begins an affair with James' friend, Capt. Charles Hammond (David Kernan) and they fall in love with each other. Richard discovers the relationship through a clever twist of events, and in a heartfelt speech talks about loyalty. He speaks about it in terms of politics, but Lady Marjorie understands the double meaning and ends things with Charles. Due to a workers' strike the first six episodes were recorded in black and white, and when the strike ended, they reshot the first episode in color. The color version is included in the set. Bonus features include commentaries on episodes #1, #3, #5, #8, #10, and #13. Disc 1 offers an alternate pilot where the main difference is Sarah storming out at episode's conclusion. This was likely what was shown in the initial U.S airing, as Sarah didn't quit until the unseen-in-the-States third episode, "Board Wages," so getting rehired would have made no sense. Disc 4 contains "The Making of Upstairs Downstairs, Part 1" (56 min), an informative special about the show's beginnings. For those who enjoy British historical dramas, Series One of Upstairs Downstairs is very good television. The stories are interesting because they are populated with characters that are unpredictable yet believable in their actions, who are brought to life by a talented cast. The series is self contained but should motivate you to seek out the others.